Your baby’s nutrition is of vital importance because it helps them grow up to be healthy and strong. The first years of life are crucial to the development of all the major organs, and your child is growing at a rapid pace! All this major growth and development means that you need to make sure your baby is getting all the right nutrients. When parents are choosing a formula to supplement breast milk or to replace breast milk, it can be difficult making a decision. So many brands make similar claims, so how do you know which one to pick? Luckily, we have several organic baby formula reviews for you to consider, and Baby’s Only organic toddler formula is one of the best ones you can choose. The Baby’s Only dairy formula appears to be the most basic formula that this company offers. Many of their other formulas have different nutrients added or taken out to accommodate each baby’s needs, like using soy or taking out the lactose. This non-GMO dairy formula would be perfect for your child if they do not have a sensitive stomach or any other additional needs. For example, if your child has a dairy allergy or is lactose intolerant, this formula will likely only cause problems. If they can handle dairy and do not have sensitivities, this formula will give them all the nutrients they need. This formula has a rating of 4.3 stars on Amazon, so there are plenty of other people who like this product too. As stated previously, your baby’s nutrition is crucial to their growth and development. As you look at different formula brands, be sure to look at the ingredients so you can know what you are really feeding your child. Though Baby’s Only dairy formula is not as complex as the company’s other products, it still has great ingredients that you will feel comfortable adding to your child’s diet. We will describe several of the main ingredients so you can understand the purpose they serve and why the company selected it. If you look at other baby formula brands, they oftentimes include corn syrups or other types of sugar. Instead, this dairy formula uses organic brown rice syrup. For one, this ingredient is organic, so any undesirable chemicals are left out of the product. Also, brown rice syrup does not create insulin spikes like other sugars, creating sustainable energy instead. You may have heard a while back that brown rice sugar may contain arsenic but Baby’s Only has done all the research necessary. You will not find arsenic or any heavy metals in this formula. Naturally, breast milk is the best kind of milk you can give to your infant. Thankfully, baby formula offers the next best nutrition to your child. This company uses organic nonfat milk from organic family farms. Once again, there are not any chemicals or harmful ingredients in the milk. All that is in there are the nutrients your child needs for proper growth and development. Looking at the formula can, there are so many necessary vitamins and other nutrients included in the product. Just with a single bottle of five fluid ounces, your baby will consume 50 percent of their daily intake of vitamin C, 16 percent of their daily protein, 20 percent of their daily protein, and 20 percent of their daily vitamin E. There are several other ingredients, including several different B vitamins, vitamin A, calcium, phosphorus, magnesium, and zinc. Overall, this formula provides balanced nutrition for your child without any harmful chemicals. The Baby’s Only dairy formula uses only non-GMO ingredients in their product, which limits your child’s exposure to harmful chemicals. 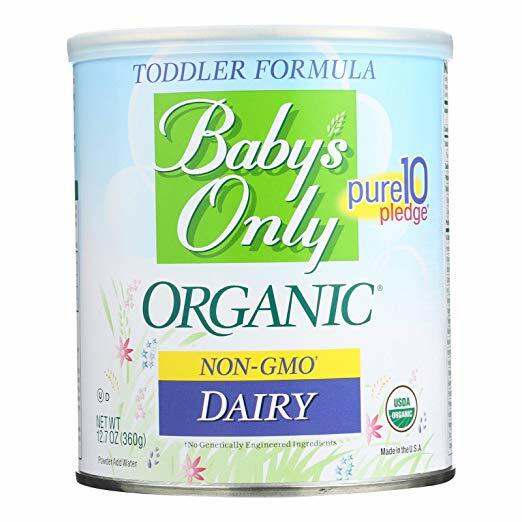 Because of their avoidance of GMO products and using organic ingredients, this dairy formula is USDA certified organic. In fact, the company website states that Baby’s Only sets its standard “beyond organic” and focuses on delivering the best product possible. This helps parents to know exactly what they are feeding their child and that the ingredients are free of harmful chemicals. Even the formula’s packaging is BPA-free, so you have no need to worry. Clean Label Project, a third-party nonprofit organization that tests different baby formulas and foods, has even given this formula great ratings. Out of over 500 products tested, this organization rates Baby’s Only “best in class” for nutritional superiority. This product comes in 12.7-ounce cans, and this specific product page on Amazon comes in a set of six cans. You can buy this set of six for $85.78 with free shipping on Amazon, but you can get the same set for $65.94 on the company website. You can also save 15 percent on your purchase if you subscribe and have the product delivered regularly. However, depending on where you live, shipping may make your purchase just as expensive as buying the same product on Amazon. You will want to look at both websites so you can figure out which website will save you the most money. Baby's Only formula is owned by the company Nature’s One, which provides baby formula, electrolyte beverages, and other products that help your child receive all the nutrients they need. This company was also the first to offer organic formula because they know the importance of limiting our children’s exposure to harmful chemicals. They test all of their products to ensure there are not any heavy metals in the product and even use BPA-free packaging. Their dedication to health and safety for your child makes them a brand that you can trust. Many customers recommend this formula to other parents because it is a high quality formula that they feel comfortable giving their child. A variety of different parents use it too, whether they wanted to use formula as a supplement or replace breast milk entirely. They even claim that it tastes much better than the other commercial formulas. They love that this formula has non-GMO and organic ingredients, which in turn give their child the nutrients they need. The company maintains high standards to make this one of the best formulas you can find on the market today. The biggest complaint from dissatisfied customers is that their baby became constipated after switching to Baby’s Only formula. This is possibly due to their child having other sensitivities, but it could also be because the baby is too young for this formula. Nature’s One specifically labels their formulas for toddlers. This is for two reasons. For one, Nature’s One strongly recommends that parents exclusively breastfeed for the first year of their child’s life. Secondly, some of the ingredients can be difficult for an infant’s developing digestive system to process, which then causes constipation. The company recommends that around a year old is the best time to introduce this formula to your child. Some other customers claim that Amazon sent them a different Baby’s Only formula than they ordered or did not send them the full set of six. If this is a common occurrence, you are better off buying from the company website or finding it in a grocery store near you. Overall, this is one of the best organic formula brands you can buy today. Nature’s One takes their products seriously and set high standards so you can receive high quality products. This Baby's Only formula is dairy-based, so it is not ideal for a child with a sensitive stomach or lactose intolerance. If they do not have any sensitivities, this formula provides all the needed nutrients for healthy growth and development. You can purchase a set of six 12.7-ounce cans for $65.94 on the Nature’s One website. There are several other high quality organic baby formula brands on the market, so be sure to check out the other reviews here at Green and Growing. Picking the right formula for your child takes time, but we have compiled a list of all the best products in one place. This will help you save time and find the best fit for your baby. Here are some top questions that I found for people seriously considering buying the Baby's Only Organic Non-GMO Dairy Toddler Formula. Does this Baby's Only formula contain DHA and ARA? This one does not, but the company does offer a dairy-based formula with added DHA and ARA. Does the brown rice syrup add arsenic to the formula? Baby's Only sets high standards and tests each of their products to ensure it does not contain arsenic or any other heavy metal. You can rest assured that this formula is safe for your child.